The state of Wyoming is situated in the mountain regions of western United States and borders Montana to the north, Colorado to the south, South Dakota and Nebraska to the east, and Idaho to the west. It is dubbed the “Equality State” for its pivotal role in pushing for gender equality by being the first state to grant women suffrage and to grant them the right to serve on juries and hold public office. Though it includes some of the most mountainous areas of the country, the majority of Wyoming is actually comprised of flat valleys and wide open plains; a fact alluded to in its name, as Wyoming means "at the big river flat" in Munsee. Spanning over 97 thousand square miles with only 579 thousand inhabitants, Wyoming is not only one of the largest US states by area, but also one of the least populous. Its major cities are Cheyenne (the state capital), Casper, Laramie, Gillette, Rock Springs, and Sheridan. Geographically speaking, the state is divided into three distinct regions. The first, the Great Plains, covers the majority of the eastern region and is characterized by vividly green bushes and short grasses. This is where the Black Hills, a mountain range that cuts through both South Dakota and Wyoming, and the vast, flat-topped Devil’s Tower hill can be found. As for the Rocky Mountains, it trails from north to south and is home to both the Grand Teton and the Yellowstone national parks, where the geyser Old Faithful resides. Lastly, the Intermontane Basins is nestled between mountain ranges, with short grasses and sparse trees. Its most famous landmark is the Red Desert, the nation's largest living dune system. Wyoming is also popular among tourists for its gorgeous natural parks, luxury resorts, and numerous recreational facilities. Among the state’s favorite recreational and outdoor activities are skiing, fishing, hunting, hiking, biking, and golfing. With a flourishing green landscape and semi-arid, continental climate (meaning it's drier, windier and relatively cooler than most), Wyoming is an ideal spot to enjoy some fun under the sun, all-year round. There are almost a hundred golf courses that can be found throughout the entire state, most of which reside in Jackson. While most of the top-ranked, high-profile golf courses usually reside in the swankier states (think California, New York) or more remote areas deep in dense forests or woodlands (such as Oregon, North Carolina), Wyoming is still a praiseworthy vacation destination for golf enthusiasts everywhere due to its breathtaking scenery and underappreciated golf courses. Listed below is our list of the top ten best public golf courses in Wyoming to guide you on your adventures should you pass this way and help you discover some lovely hidden gems that will surely make your trip worth it. With almost a hundred golf courses scattered all throughout the state, we’ve crowned Teton Pines Country Club & Resort as not only the best in the northwest region of Wyoming but the overall best in the state as well. Surrounded by breathtaking mountain ranges, this Arnold Palmer-designed course has been a favorite of many locals and tourists from far and wide ever since it first opened in 1987. Despite its 6,200-feet altitude, the fairly level terrain that is characteristic of the Wyoming landscape is still present here. However, Palmer has put it to such creative use that it sets a new standard for other golf courses in the state. With judiciously laid out bunkers of pristine white sand and water features coming into play on many holes, the layout at Teton Pines C.C. is certainly challenging and downright unforgiving at times. Teton Pines is purely a shot maker's course, demanding carefully strategized strokes as their lightning-quick greens and well-manicured fairways magnify any mistakes. The best holes of the track are: the par 5, 634-yard 7th, a test in both drive and accuracy as it is enclosed by swathes of evergreen trees and a natural waterway to the left of the hole, fortified by a large bunker on the right of the fairway; the 12th, a 221-yard par 3 with a forced carry over the waters of a vast, sparkling blue pond; the 13th, which stretches up to an impressive 463-yards and is one of the longest par 4s of the entire layout, adorned with two bunkers guarding the green; and the par-3 16th, Teton Pines' signature hole, with a large green flanked by a bunker to the back and a pond to the front, and the Rocky Mountains providing a gorgeous backdrop. With its spectacular scenery and well-maintained, championship-caliber layout, it’s not hard to see why Teton Pines Country Club is so beloved by golf enthusiasts everywhere and not just those from the state. It is definitely one of the best golf courses in Wyoming. Coming in at second place is northwest Wyoming’s best public golf course: the Jackson Hole Golf & Tennis Club. First launched in 1965, the course was designed by Bob E. Baldock, an architect famous for his work on Lone Tree Golf Course and the Foxtail Golf Club in California. Though it was later restored by Robert Trent Jones Jr. (as the property had come into new ownership) in 1973 and once again in 2007, it still emanates all the best qualities of a Baldock showpiece. The semi-private course is a beautiful gem that features flourishing native wildlife and stunning views of the mountain splendor and idyllic Teton County landscape. It was named one of the "Best in State" by Golf Digest consecutively from 2013 to 2014 and ranked as high as 3rd and 4th for both Golf Magazine's and Golfweek's "Best Public Courses in Wyoming" lists in 2013 respectively. Equally impressive is the course's par 72 parkland layout. With improved bunkers and facility conditions (courtesy of Robert Trent Jones Jr.), the course at Jackson Hole poses a formidable challenge for any golfer, with its fast-rolling greens and well-groomed fairways lined by a variety of towering trees. Relatively flat and quite an enjoyable walk, the track is riddled with plenty of sand bunkers and water hazards to make for an interesting round. The layout becomes particularly impressive as it reaches the finishing nine, where many of the best holes are found. Examples include: the par-3 13th (the course's signature hole), with a green guarded by a lake in front and another one behind, with an especially scenic view of the Grand Teton mountain range off the tee; the 14th, a par 4 that stretches up to 481 yards from the tips and has several trees and a water hazard fortifying its green; and the harrowing 203-yard 16th which has plenty of bunkers surrounding the green and is frequently named the best par-3 of the layout. Should you ever happen to find yourself in Wyoming, make sure to pack your clubs and head to Jackson Hole Golf & Tennis Club for one of the best golfing experiences the state has to offer. Situated in the city of Rawlins and less than two hours north of Craig, Colorado is not only one of the state’s best public golf courses, but Wyoming’s longest one as well: the Rochelle Ranch Golf Course. A municipal course that measures a sprawling 7,925 yards, Rochelle Ranch is a Ken Kavanaugh signature piece. It was sculpted from a slab of mountainside terrain set 6,800 feet atop the Red Desert steppe of south-central Wyoming. Charming and idyllic, this 18-hole gem is adorned with lush bent grass greens and flourishing western wildlife (such as antelope and bison) common in the area. It is surrounded by numerous mountain ranges from every direction, such as the Sierra Madre, Medicine Bow, Haystack, and Rattle Snake mountains to name a few. It’s also well worth noting that the course is actually the legacy of two wealthy local sheep ranchers, Curt and Marian Rochelle, who donated the property as a gift to the city back in 2004. A links-style course, the par-72 championship layout at Rochelle Ranch boasts wide-open fairways bordered not by the usual towering trees, but by sagebrush, and scrub brushes to allow for expansive, unencumbered views of the breathtaking natural setting. Other interesting design features include weathered, wind-blown bunkers, sweeping sand dunes, and undulating greens, all meant to emulate the “rugged, rough-hewn look” Kavanaugh envisioned for the property. Aside from being named as one of Golf Magazine's "Top 5 Courses to Play in Wyoming", Rochelle Ranch is particularly famous for its extremely challenging layout. It was even recognized as one of the "Most Difficult Courses in America" by Golf Digest in 2010. Graced with several water hazards, a few doglegs, and plenty of dramatic elevation changes, as well as an almost-frightening length at 7,925 yards from the tips, the course is home to some noteworthy risk-reward holes. Bunkers are usually laid out in the middle of the wide fairways or on their edges, making precision and excellent positioning an absolute necessity here. The most memorable holes of the track are the 13th (the signature hole), the 16th (the best par 3), and the 18th (the best par 5). Also worth praising is the exceptional service from the staff and grounds crew, as well as the budget-friendly green fees. Their off-course amenities include cart and pull-cart rentals, a driving range, a full-service pro shop, generous practice facilities, and a clubhouse with a bar and grill (named Bunkerz) that serves some of the best milkshakes, along with other meals and beverages. If you’re in need of a good golfing fix in Wyoming, look no further than Rochelle Ranch Golf Course in Rawlins. It is one of the best value-for-money courses in the entire state. The Three Crowns Golf Club is an 18-hole golfing facility hailing from the city of Casper in central Wyoming. It was first established in 2005 and flaunts a beautiful, expertly designed parkland layout courtesy of Robert Trent Jones Jr. With its fair, undulating bent grass greens and fairways of velvety Kentucky bluegrass, the Three Crowns Golf Club offers a premium golfing experience deep in the heart of the state but still nearby most of Wyoming's major cities. Ranking 2nd in Golfweek's "Best Public Golf Courses in Wyoming" in 2016, the course is sculpted atop 7,065 yards of what used to be an Amoco oil refinery site near the North Platte River. Despite having the gorgeous Casper Mountains close by, the Three Crowns Golf Club is at a disadvantage because it lies in the heart of a highly-urbanized city with various commercial, industrial, and residential properties surrounding it that could be off-putting for some. However, if you’re willing to look past appearances, the golf course in and of itself still holds plenty of merits and is worthy of all the recognition that it has been receiving thus far. The par-72 parkland layout features over 61 well-placed bunkers decked in pristine white sand, as well as several sparkling blue water lakes that come into play on a number of holes. Players are also given the choice of four different sets of tees to suit their skill level. While the generous fairways and seemingly straightforward layout may give the impression that it’s an easy outing, don’t be fooled because Three Crowns Golf Club has plenty of challenges to offer for all players across different talents and preferences. Much of the course’s difficulty is posed by the awkward approach shot angles and the high winds that is typical in this area. While many of the holes here are excellent, there are a few that particularly stands out: the 6th, a 205-yard par-3 that features the most elevated tee shot of the entire layout, overlooking a pond and a layout that sets up your shots against the wind; the par-4 15th, noteworthy for its angled water hazard lying at the right of the fairway; and the signature hole, the 415-yard par-4 18th, featuring a heavily-fortified green, a pond to the right, and a split fairway that will leave players agonizing over all possible options in order to card a good score on this testy finishing hole. Nestled at the foot of the stunning Big Horn Mountains of Buffalo, Wyoming is a hidden gem from the state’s northwest corner: the Buffalo Golf Course. Another 18-hole municipal golfing facility, the course at Buffalo Golf Club dates back to 1980 and was designed by Frank Hummel, who gained prominence for his work on the Greg Mastriona Golf Courses of Colorado. Crowned the "Best Municipal Golf Club" in the state by Golf Digest in 2009, Buffalo Golf Club is well worth the visit for its affordable green fees alone. With well-manicured facilities and tall bent grass carpeting the greens and fairways, it offers golf enthusiasts from all over the best value in the state. Along with picture-perfect sunset views framed by mature Ponderosa Pines and Cottonwood trees, the course is also home to a small herd of antelope that prance through the property, adding to its charm. The par-72 championship layout features some dramatic elevation changes, a fair share of sloping fairways, and the occasional water hazard that comes into play for a few of the holes routed along the track. Four sets of tees are available for players to choose from, depending on their respective skill levels. Some of the most notable holes of the track are: the 1st, giving players a rough start with its uphill fairway and natural waterways streaking right across it, demanding a solid, lengthy drive; the short, 166-yard par-3 4th hole that descends into a canyon; the 520-yard par-5 9th, featuring a green fortified by a swathe of surrounding trees and a large pond; and the 427-yard 13th hole, a par-4 with a treacherously tight fairway that demands absolute accuracy. . Guests can also avail of the various off-course amenities at Buffalo Golf Club, such as a pro shop that is stocked with some high-profile brands, custom club fitting, club rentals, cart and pull-cart rentals, a driving range, a chipping area, putting greens, practice bunkers, and a newly renovated clubhouse with its own restaurant (named The Clubhouse Grille) that serves breakfast, lunch, and dinner at a reasonable rate. They also have a very professional and accommodating staff who are always ready to help you with whatever concerns. The first course on the list to represent Wyoming's capital city, Cheyenne Country Club is a semi-private, 18-hole golf course that's been around since 1917. A very popular course that’s patronized by locals and visitors alike, residents of the Colorado cities of Carr and Hereford will be pleased to know that Cheyenne Country Club is only less than an hour’s drive away from their respective locations. Though it’s not open for play to the general public on weekends, daily fee players are more than welcome to drop by for a few rounds on the weekdays and be pampered by their accommodating staff, excellent ground maintenance, and an elegantly designed traditional 18-hole layout that is among Wyoming’s best. All 6,547 yards of the gently rolling countryside terrain flaunts Bermuda greens and bluegrass fairways bordered by swathes of full-grown pine trees. The handiwork of architect Herbert Lockwood, the Cheyenne Golf Club has a perfect distribution of long, medium, and short holes as they have 6 holes each of par-5s, par-4s, and par-3s respectively. The layout manages to remain friendly to a wide spectrum of players despite some truly troublesome holes. It sports around 80 or so sand bunkers fortifying the undulating greens even more, and a handful of water features and trees serving as additional obstacles for all players to overcome. The end result is a formidable test of skills that demand full use of all your clubs in the bag before the round is over. The course’s signature hole is the 16th, a long and narrow 578-yard par-5 with an especially harsh dogleg fairway. Off-course amenities include a pro shop, putting greens, a driving range, an elegant clubhouse with a bar and an outdoor pool, tennis court, snack bar, and a full-service restaurant that serves meals around the clock. Tip: try their salmon special, blueberry pancakes, or chicken avocado burger. The top of the line facilities, services, and challenging layout that they have here simply goes to show that you don't have to burn a hole in your pocket just to get a first-class golf experience, especially not at Cheyenne Country Club. It is the runaway winner for the title of the best golf course in Cheyenne, Wyoming. Another pick hailing from western Wyoming, Star Valley Ranch Country Club is an award-winning, semi-private golf community that’s home to two distinct courses: the 9-hole Aspen Hills and the 18-hole Cedar Creek. The resort is nestled deep in the heart of Star Valley with the Bridger-Teton National Forest close by. It was opened in 1979 and designed by Harold Stewart. With one of the largest national forests nearby, the Cedar Creek Course boasts some of the most splendid natural views Wyoming has to offer, like the crystal clear waters of the Periodic Spring and the gorgeous rock features of Snake River Canyon. Lovingly sculpted from 6,446 yards of rich grasslands, the course itself is home to a stunning 30-acre wide lake and flaunts bent grass greens and fairways carpeted with velvety bluegrass. When you’re soaking in so many beautiful sights, it's hard not to fall under the spell of Star Valley once you play here. Cedar Creek sports a generally flat, wide-open layout highly reminiscent of Scottish links courses. A curious choice, the track has no sand bunkers in sight but opts for a number of vast lakes and flowing streams as their main hazards instead. The greens putt fast and fair while most of the fairways are generously open albeit with occasional doglegs, out-of-bounds, and a few trees that come into play. Especially noteworthy are the par 5s, namely: the 495-yard, 2nd hole that's especially tricky for its lay-up tee shot and long but narrow fairway that’s sloping downhill; the 9th hole featuring a pronounced dogleg left with the Cedar Creek cutting across half of the fairway and an out-of-bounds thrown in for good measure; and the risk-reward 18th hole, rounding out at 460 yards downhill and ending the round on a high note with its elevated, sloping green fortified by a lateral water hazard to the left, a small pond to the front, and out-of-bounds to the right. With a terrific track that's fun and friendly, maintained in pristine condition, and an immersive natural setting, Cedar Creek Course at the Star Valley Ranch Country Club is more than worth the travel time and the green fee. It is one of the best golf courses in western Wyoming. Another municipal golf course on our list, located only a stone's throw away from the city of Gillette, is the Bell Nob Golf Course. Its stunning countryside views, impeccable conditioning, and terrific championship layout are what earned it a spot here, among the ranks of Wyoming's best public golf courses. It’s not to be confused with the Bell Nob Executive Golf Course, a 9-hole track nearby that serve to expand this course into 27 holes. Operated by Campbell County Parks and Recreation, Bell Nob Golf Course has been a popular golfing destination ever since it first opened in 1981. This 18-hole public course has Frank Hummel to thank for its gorgeous design, as Bell Nob was lovingly sculpted from a terrain of gently rolling hills and sagebrush-covered plains. All 7,289 yards of the course is adorned with bluegrass fairways and bent grass greens, as well as rows of towering trees, all kept in impeccable shape by a dedicated staff and grounds crew. Strategically located on the way to Mount Rushmore from the east, Yellowstone National Park to the west, and the Devil’s Tower nearby, Bell Nob Golf Course is a must-add on your to-do list when visiting the state of Wyoming. The par-72 championship layout is an absolute blast to play, as there are roughly 40 strategically-laid out sand bunkers and numerous water hazards to keep the rounds interesting. There are also four sets of tee boxes to accommodate a wide variety of players’ skill levels. It’s a links-style course with a small-town feel, perfect for a short and cozy family vacation. Feel free to inquire about their daily specials or discounts as well, if you want to shave off a few bucks from the already affordable green fees. Golf enthusiasts in the area, make sure to stop by this unassuming gem for a few fun rounds on one of the best golf courses in Wyoming. Open to the public from the months of April to October, Lander Golf Club is a golf lover's summer vacation dream with its gorgeous natural setting and clear blue skies for miles. Remote and serene, this public golf facility is perched at an altitude of 5,600 feet; that’s quite the accomplishment considering Wyoming is a fairly flat state. It first opened in 1933 and has since then garnered great acclaim from both prestigious golfing magazines and the general playing public. At Lander Golf and Country Club, guests can enjoy the 6,574 yards of mountainous terrain covered with bent grass greens from the tee to the green, as well as the stunning cliffs overlooking the rushing waters of the Popo Agie River disappear into a deep limestone canyon. There’s also an abundance of towering peaks that can be seen throughout the track and some flourishing wildlife as well, casually strolling through the grounds. The par-71 links-style layout is welcoming and friendly to novices but is still enjoyably challenging for the more seasoned golfers as well. There are over 60 or so sand bunkers fortifying the track's 18 holes as it routes through a lightly wooded meadow of mature trees. Thrown into the mix are a few water hazards here and there and some subtle but serviceable elevation changes that keep this a pleasantly walkable course. The fairways are well-manicured and generous, but the lightning-fast greens are not so forgiving and serve to provide a much-needed hike to the overall difficulty level of the course. Other amenities at Lander Golf and Country Club are putting greens, a teaching pro, a driving range, a pro shop, and a comely clubhouse. The staff is very courteous and helpful, while the green fees are also very reasonable. All of these positive qualities - from the charming scenery to the terrific links-style layout - makes Lander Golf and Country Club a premier golfing destination in central Wyoming that deserves to stand alongside the state's other top golf courses. Last but certainly not the least, we'll be ending our list on a high note with the Olive Glenn Golf and Country Club. Yellowstone County's premier golfing destination, this semi-private 18-hole golf facility is situated in the town of Cody in northwest Wyoming. It was first established in 1970, but the bent grass carpeting the fairways and the bluegrass greens are still as lush and fresh as ever. Ranked one of the top five "Best Golf Courses You Can Play" in the entire state of Wyoming in 2017, Olive Glenn Golf and Country Club sit atop a wide valley with the Shoshone River in sight as it comes into view from the peaks of the snow-capped Rocky Mountains. Revel in the clean, countryside air with the frolicking deer and antelopes that roam the property grounds and be transported to an idyllic paradise that’s only a little over an hour away from Cooke City in Montana. The charming par-72 layout is equally as enchanting as its scenery, as it boasts a fine assortment of 18 gorgeous holes, all with receptive greens and spacious fairways, true to classical links fashion. Fairly playable for beginners, there's also plenty of sand bunkers, elevation changes, and the occasional blind shot here and there to pique the interest of more proficient players. Along with the 40 or so sand bunkers, there are several water features puncturing the track every now and again. In fact, a running stream slices through the fairways of the 3rd, 8th, and 15th holes. Also noteworthy are the houses serving as hazards for the front nine, flanking both sides of the fairways of the 1st and 2nd holes, then, later on, only one side for the 8th and 9th. The best of the bunch is the 338-yard, par-4 16th hole, a sight to behold with its green in an isle of its own, surrounded by the sparkling blue waters of a vast pond. The course also offers other amenities such as a full-service golf shop, a practice range, putting greens, a teaching pro, cart and club rentals, and an on-site restaurant, banquet hall, and bar. Olive Glenn Golf and Country Club is just another compelling reason for golf enthusiasts everywhere to pack up their clubs and visit Wyoming for some truly wonderful golfing experience. For a state with a booming sports and recreational activities industry, it's hardly surprising that Wyoming is home to some truly excellent, high-class golf courses. What it often lacks in steep, rolling terrain, it more than makes up for in picture-perfect scenery and natural beauty. Many of the courses mentioned here are deeply rooted in the area's history and culture, with the oldest dating all the way back to 1917 and the most recent opening only in 2004. A recurring feature among these courses are the links-inspired layouts, marvelous mountain views, and frolicking wildlife. 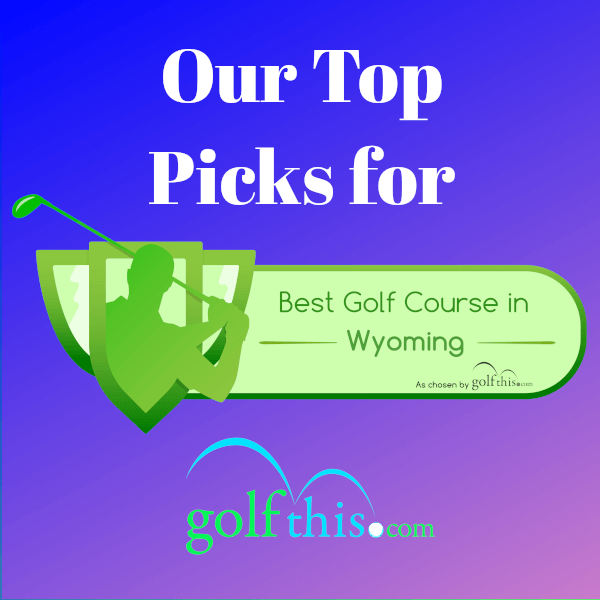 Seeing as this list was based on our personal preferences, it's perfectly fine that you should have your own opinion on Wyoming's best public golf courses. Let us know some worthy courses that you think we may have missed on our list. We'd love to hear from you.